As Director of Corporate Development, Jason is working for change by getting his Essex colleagues to focus on citizen outcomes and experience, using the tools of service and interaction design, ethnography, data and analytics, recognising there will be many different ways forward, not all of them involving 'IT'. Richard, whose role at low-code platform provider Netcall includes thinking about the future of IT, says he spends a lot of time ‘filtering hype’ and agrees that tech should be subservient when it comes to change. The company is still getting asked to automate bad processes, and culture remains the biggest challenge. Skill shortages are also a problem for public service organisations that cannot offer 24-year-old coders Macbooks, pizza and ‘beer o’clock’. But there are various solutions, including growing your own; making use of the ‘missing 50%’ of the IT/digital workforce (ie women); flexible contracting via the new digital frameworks; and using low-code to deliver customised applications created by business analysts rather than coders. Procurement comes up again as an issue: why are legacy suppliers STILL getting the contracts? Nobody ever got fired for hiring the usual suspects still applies, apparently, although there is agreement that GCloud and the other new tech frameworks are becoming real game-changers. 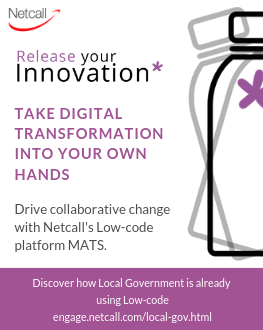 Netcall's purpose is to empower organisations to simplify digital transformation. There is a sense of urgency around transformation, but it comes at a cost. Time, resources and money are scarce. All too often, new rip and replace solutions are expensive and inflexible. They need you to change the way you work. It's not useful or sustainable. Take transformation into your own hands. Gain the tools you need to develop solutions that quickly move your processes, communications and culture forward. The Netcall Low-code platform gives you everything you need to build, deploy and improve apps without coding. So what makes Netcall different? Easy to use, functional, smartly designed tech that brings business experts and in-house developer talent together so they can collaborate on solutions as one team. You'll feel reassured by the evidence of our customer's history of success. If you are looking to transfer knowledge internally, work pragmatically and lead iterative transformation from the ground-up, do get in touch.